UNTV-BMPI Chairman and CEO Daniel Razon sent his heart to the jampacked Smart-Araneta Coliseum in Quezon City as he held up the Guinness World Records’ Officially Amazing plaque. The October 12 event marked the 35th anniversary of the radio, television and internet program. 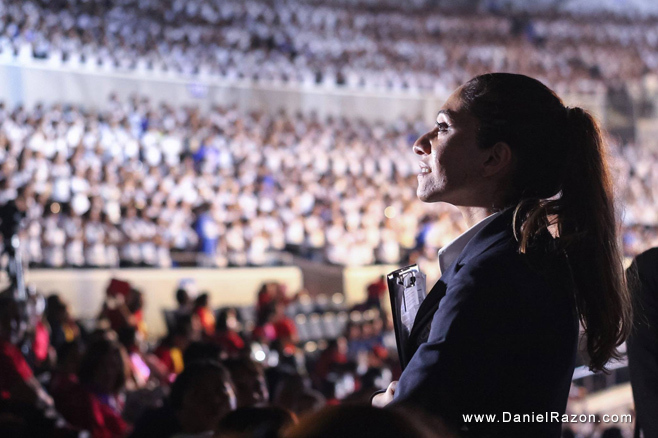 It was also the date when the Ang Dating Daan Chorale has set a new Guinness World Records record for the Largest Gospel Choir with 8,688 choir participants. “This is something that we did not intend to do – to get the Guinness Book of World Records [title]. But our hearts intended to give thanks to God,” said Kuya Daniel, who co-hosts Ang Dating Daan program with international evangelist Bro. Eli Soriano. Ang Dating Daan is the flagship radio, television, and online program of Members Church of God International (MCGI) and is to date the longest-running religious show in the Philippines. It is known internationally as The Old Path, El Camino Antiguo (Spanish), O Caminho Antigo (Portuguese). 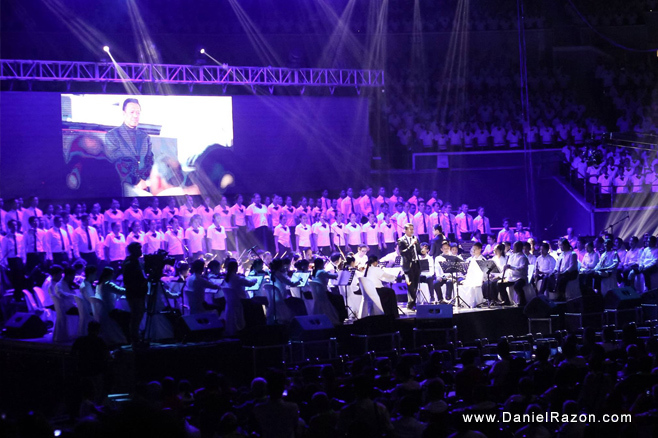 For the 35th year of Ang Dating Daan, MCGI celebrated it with a grand musical performance that won the world record title along with a special charity effort for the 1,700 persons with disabilities (PWDs). Guinness adjudicator Fortuna Burke Melhelm congratulated and welcomed MCGI to the Guinness family as she conferred the record-breaking title. “The record for the largest gospel choir was 4,745. Today you have the brand new Guinness World Record title!” Ms. Melhelm announced that brought the participants and audience into long, resounding hoorays. “I am overwhelmed by the record that the Members of the Church of God has set tonight,” Bro. Eli, the Overall Servant to MCGI, said via live streaming from South America. “Singing for the glory of the Lord is our pride,” the evangelist ended, thanking Guinness for witnessing the mega event. Guinness’ official count of choir members was 8,688. Incidentally, the number is also the emergency and rescue hotline of UNTV, the 911-UNTV or 911-8688. To recall, Kuya Daniel, who is dubbed Mr. Public Service in the Philippines, introduced the pioneering Tulong Muna Bago Balita (Rescue First, Report Later), a ground-breaking journalism practice which gives priority to saving lives than breaking news or getting scoops. 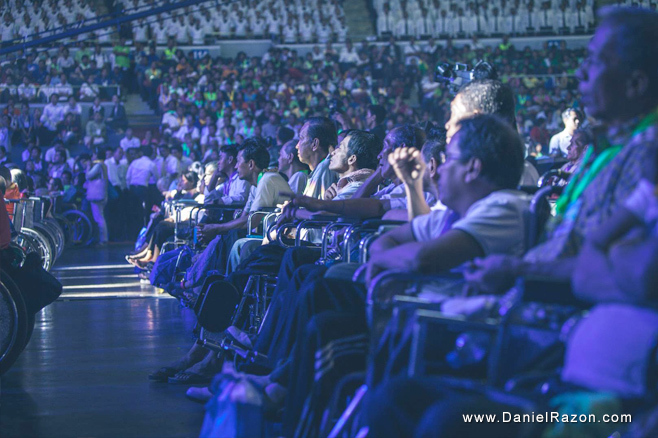 More than 1,700 people with disabilities (PWD) were Ang Dating Daan’s honored guests during its anniversary event. Twelve PWD institutions received cash gifts worth Php100,000 each. A total of 300,000 pesos was also given to 30 attendees selected via raffle draw. Bro. Eli and Kuya Daniel also handed in cash envelopes to each PWD present during the event. Besides financial assistance, wheelchairs, canes, and hearing aids were also distributed. “We thank God for giving us an opportunity to do what we ought to do. Thank you so much for coming here today,” remarked Kuya Daniel. “Had it not been for His mercy, we wouldn’t have reached 35 years with all the persecutions and trials we encountered,” expressed Kuya Daniel. “For the hope that God is giving and if not for His works, we are nothing. We believe all these are God’s works,” he summed up. Ang Dating Daan started broadcast in 1980 with only three people in the production that included Kuya Daniel.